← Great News: Plovers nest on South Manitou Island. The St. Mary’s River produces more sea lamprey than all Great Lakes tributaries combined. Sault St. Marie, Ont. — Anglers on the St. Mary’s River may notice a change in water levels in the river’s rapids in June and July. An experimental sea lamprey trapping effort below the Brookfield Renewable Power Co. hydro-dam there requires higher flows at night when spawning lampreys are more active, said Great Lakes Fishery Commission staffers. This is the second season of the experiment and the flow-change agreement between GLFC and the power company. Researchers say the river produces more lampreys than all other Great Lakes tributaries combined. The trapping experiment is testing net designs and the effectiveness of changing the dam’s flow regime. “There are about 15,000 spawning sea lamprey in the river,” said Mike Siefkes, the GLFC sea lamprey program specialist. “We now capture about 4,700 lampreys at all the trap sites on the river. We get 3,500 at the power site. The St Mary’s power plant trapping study is one of several locations on the river where traps are used. Trapping is one part of the commission’s lamprey management strategy and three-pronged research effort now under way. Earlier telemetry studies with radio-tagged lamprey showed researchers how, when, and where lampreys move. What they found is that lampreys move more at night and in higher water flows. Mapping their route up a river helped researchers determine where to locate traps. 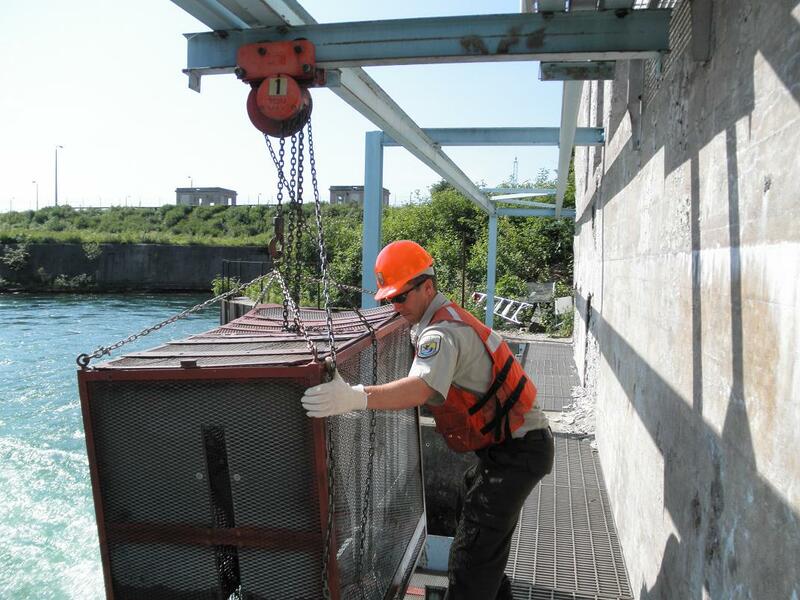 The two-year trapping study is funded by the Great Lakes Restoration Initiative. The cost is $225,000. Siefkes said the initial data will determine if a third year is needed. If the results prove statistically significant, the GLFC will decide whether changes are needed in water allocations. The power company is allowed to release only so much under the American/Canadian International Joint Commission water allocation plan. Releasing more at night means less released during the day, which affects its ability to provide power during warmer months when electrical demand is higher to power air conditioning units. The St. Mary’s trapping experiment is important, according to Gayden, because it removes the sea lampreys before they spawn. Lake Huron is home to approximately 130,000 “spawning-phase” lampreys, according to Siefkes. Half are female and each of those can lay 60,000 to 100,000 eggs. The lake population is held in check largely by ongoing lampricide applications on streams where they have already spawned. The chemical treatment targets and kills young lamprey larvae before they migrate downstream into the Great Lakes. “That takes out millions and millions of larvae every year,” Siefkes said. The trapping program is one of several methods being examined for lamprey control. Earlier efforts to control the population by introducing sterile males were shelved in favor of trapping. The GLFC is also experimenting with the use of lamprey pheromones, chemical scents that might be used to attract lamprey to traps or dispersed as a chemical barrier that might effectively keep spawning lampreys out of rivers. This entry was posted in Uncategorized and tagged DNR, Great Lakes Fishery Commission, Great Lakes Restoration Initiative, Sea Lamprey, St. Mary's River. Bookmark the permalink.